3.5 km Walk / Run Course - The family friendly 3.5 km course is flat and entirely on pavement. 10 km Run Course - The 10 km course is a combination of pavement and trail that goes down Avondale Ave., throughout the T.J. Dolan Conservation Area and back. Weaner Run - The Weaner Run is a 500 meter run for children age 6 and under. Register for this FREE event at the Hog Jog booth on race day between 3:00 and 5:15 p.m.
Post-race Pork Meal - Your race entry fee includes one post-race meal ticket, which includes pork generously donated by Conestoga Meats. You can purchase extra meal tickets for your guests at a cost of $5.00 each. Awards - Awards will go to the top individual and team pledge raisers, as well as the 1st place male and female runners in each age category in the 3.5 & 10 KM events. Winners must be present to receive award. Race Kit Pick up - Kits can be picked up at the Hog Jog registration area on race day from 3:00-6:00.pm. Register Online - Click Here Online registrations will close at midnight Tuesday, June 18, 2019. 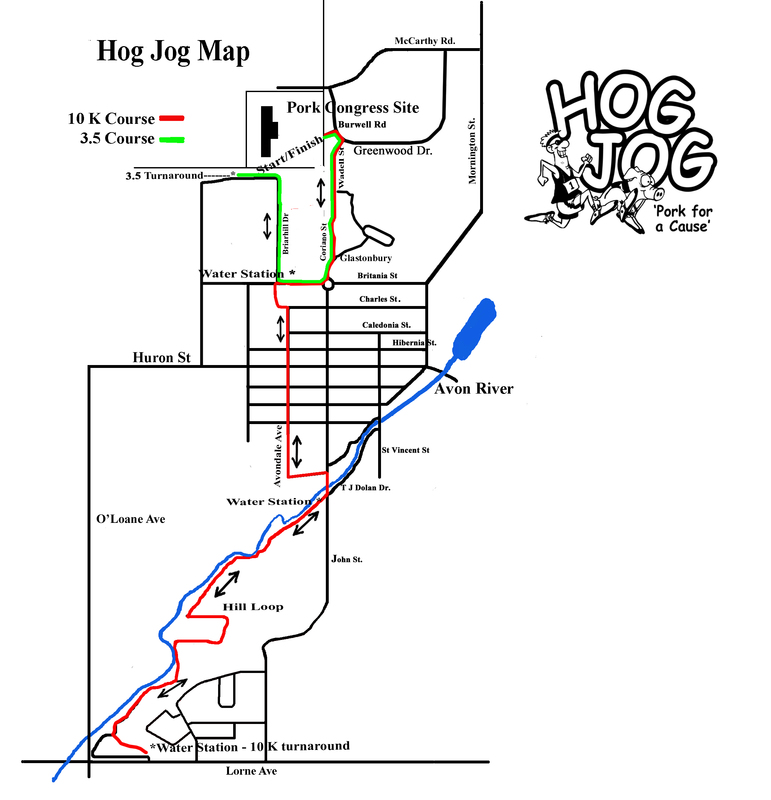 Register in Person - Registration will be accepted on race day from 3:00-6:00 pm at the Hog Jog registration area. Water Stations - Water stations will be located along the course. Weather Cancellation - In the event of threatening weather, the race may be delayed or cancelled. Registered participants will be notified through e-mail. A message will be posted on the Hog Jog web site and Facebook event page.. There will be no refunds if we have to cancel due to threatening weather.